Christine McIver, will use her talents to guide you and give you direction moving through challenges and much more. 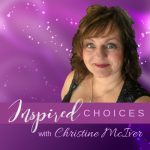 Christine McIver is a Holographist Coach, Inspirational Speaker, TV & Radio Personality as well as the Founder & Owner of Inspired Choices Network. Do You Have Projections in the Shadows of Your Possibilities? My Whole Life is Falling Apart!!! How does it get any better? Surviving….Yuck! That’s like taking crumbs! If You Want It…TAKE IT! My Life is a Zoo…I’m a Rabbit! Change Cramps…no Midol for that Baby! What is this ACCESS thing? Drop The Excuses! Create the Life You Desire NOW! Are You Buying the Lie of Sadness?